Previous Ofcom research (PDF, 268.9 KB) found many people don’t feel broadcasters are making programmes that authentically portray their lives and communities. Women are under-represented. Women account for 48% of employees across the five main broadcasters, versus 51% of the wider UK population. Women are even less well represented at senior levels. All of the main five broadcasters have more men in senior roles than women. Ethnic minority employees are under-represented. Ethnic minority employees make up 12% of employees across the five main broadcasters, lower than the UK population average of 14%. Ethnic-minority representation is even lower at senior levels. 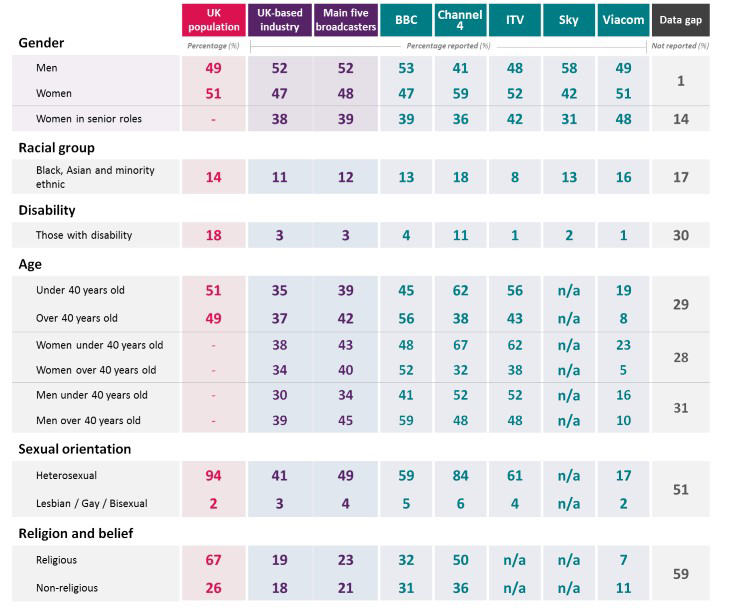 Disabled people appear to be significantly under-represented. Just 3% of employees across the five main broadcasters self-report as disabled, compared to 18% of the UK population. Third, diversity transformation should be led from the top. We want chief executives to be accountable for delivery against their diversity targets. Further develop our monitoring programme. Today’s report is the first in a series of annual publications measuring the diversity of the TV industry, identifying which broadcasters are improving and which have more to do. We will work with broadcasters to help them to improve the quality and comparability of their data, and explore what new information can be provided to assess the social class of people in broadcasting. Holding broadcasters to account on equal opportunities obligations. We have examined the arrangements each broadcaster has in place to promote equal employment opportunities. Those that we feel have inadequate arrangements in place will be asked to explain how they intend to meet their obligations. Better diversity guidance. In light of today’s report, we will update our diversity guidance for broadcasters. Broadcasters must consider this when developing their arrangements to promote equal opportunities. Enforcement action against broadcasters who failed to provide required data. 57 broadcasters failed to our request for information before the deadline, and we have begun enforcement action. Seeking additional powers. We have written to the Secretary of State for Digital, Culture, Media and Sport, to allow us to require broadcasters to provide data on a broader range of characteristics, rather than sections being voluntary, and require their equal opportunities arrangements to cover these characteristics.